One place to find batiks in Thailand is along Sampeng Lane at the sarong shops. 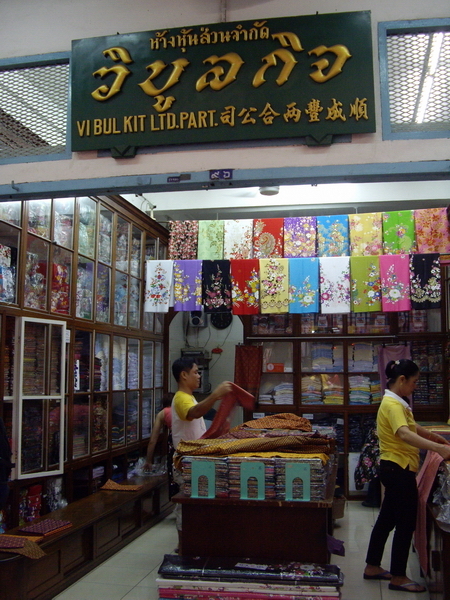 Two famous shops are Emchit and Vibul Kit. The shop numbers go in order. Even numbers on one side, odd numbers on the other side of the lane. Vibul Kit is #96 and Emchit is nearby. A sarong is 2 meters (a little more than 2 yards) and costs approximately 150 baht. It is great for quilting and if you are looking for Thai fabrics, get some of the other sarongs too. Some have small prints, and some have plain colors with border prints. See below for batiks from Emchit. Vibul Kit carries the same line. As for other places to buy batiks, I will let you know when I find them! #96 Vibul Kit - sarong fabric which can be used for quilting. We are interested to be your supplier. We will supply you with qualified manual, chopped and printing cotton batik at the best prices. We also receive order from your design. We most often use 100% Cotton, wide 44/5”, construction 132×72, 40×40. combed, 110gsm. And 100% Rayon, wide 44″, construction 80×60, 30×30 is about $2.8 per yards. We look forward to your kind response. There is a picture of some numbers, for example 636. It’s not two words, which is their mistake. Just type the number.